I feel like I may have not articulated the question very well. I want to ask: when "they" say that there is (x ammount) of (nutrient y) in 100g of (vegetable z), how do they account for the differences between vegetables grown on one farm as opposed to another? There is nutrition data for each individual vegetables online but I understand that nutrition can vary alot between plant grown in different soils. How are these nutrition levels determined? Reading Plowmans Folly and the author seemed to contradict himself by saying plowing is bad but also talking about how he disked a field the recompacted a few strips to reestablish capliary and transpalnt tomatoes into. I thought disking IS plowing so I did some Google research. Let me make sure that I understand this correctly by using comparisons to tools I do understand. A molboard plow would be like using a spade to invert soil. A chisel plow would be like using a broadfork to loosen up the soil without inverting it. Disking would be like breaking up clods with a hoe. Do i understand these correctly? Next question: at what point does it stop being "no til"? I read that chisel plows are used prior to planting in no til farms. Does that mean that no til draws the line at inverting soil and everything else is fair game? I literally lol'ed at: "There is surely more than one way to skin this cat (and PETA wont like any of them)"
This guy wrote a pretty harsh article regarding Permaculture. What do you guys think? Angry dude who thinks having an internet connection makes him an expert? Or do you think hes onto something? Susan Doyon wrote: Do not put your goat on a rope unless you will stay with it to protect it . is is a sad thing to loose a goat to a coyote or dog, takes only a moment for a predetor to hamstring a goat or sheep . They rely on you to protect them, use livestock panels move them as the goat clears an area . 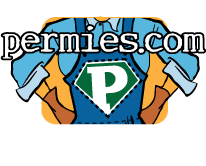 It is always nice to have an experienced permie help us to head off a problem before it occurs. thank you, Susan. Rose Pinder wrote: What is crimping? Any idea what the weeds were? eg invasive perennial grasses with runners? Glad you asked. Crimping is simply breaking the stem without severing it. Think about a plastic straw. It bends only so much until it crimps. For most annual plants, crimping their stems is enough to kill them. I highly recommend the link i provided for learning more details about this method. They did a really good job describing it and provided some pretty clear pictures. That is, in fact, the site where I learned to make a hand crimper (as opposed to the tractor mounted roller-crimpers that large farms use. You hit the nail on the head with perenial running grass. That is the most prominent and troublesome weed we have. There are also clumping grasses and a wide range of things I either cant identify or cant name in English as they dont grow in English speaking countries as far as i know. Thing is, to get the cover crop going, I'm going to have to clear out or weaken the weeds that are already established. Since Operation Goat On A Rope can't be implemented until we have a goat to put on said rope, I decided to try an experiment to see which of the following three methods would give the best weed control for the least effort: pulling them out with the field screw and rake, crimping then covering with 6 inches of leaves or crimping only. As you can see from the picture, after a week the row that was only crimped is rife with grasses, sticking straight up like so many middle fingers. This is probably not going to be sufficient to give my cover crops the advantage they need to get established; moving on. The second row, I painstakingly loosened the weeds with my trusty field screw, raked them up for pig food then sowed a mixture of: buckwheat, oats and sorghum to cover things up. None of the cover crop has germinated since I was banking on a typhoon that never came and consequentially didn't water. I expect germination after it finally rains. I'm in no rush. Ultimately, I feel like this approach took about as much time and energy as it took to transfer a 6 inch killer mulch to the next row though this method yielded three heaping wheelbarrows full of pig food. On the third row, I broke out the hand crimper all over again and pinned down that grass like my name was GSP. I then covered everything with leaves. Some of the leaves in our compost pile are from aleopathic trees (not sure about the English name of this tree species) making this killer mulch extra deadly. True, I may feel pretty dumb when I transplant broccoli into this row and find that aleopathy swings both ways or I might find that brassicas aren't bothered by this particular aleopathic compound. Only experimentation will tell. Lemongrass works great for repelling mosquitoes though it is hard to really estimate a range or an effective concentration to keep the little suckers away. I found that my legs get the most attention when I'm out in the field and since it is way too hot and humid to wear long pants, I've had to just grin and bear it, that is, until today. Putting lemongrass in my pockets has been ineffective. Rubbing it on my skin has not shown any noticeable effect either. Sticking a clump in each boot, however, has done wonders. Grass in the boot has been highly effective at keeping my calves bite free. To be fair, the mosquitoes might be deterred by the leaves waving around rather than the scent. At any rate, it keeps them away from my legs. I haven't gotten bit on my arms either though my upper body gets less attention with or without the lemon grass in my boot. In case you havent put 2-and-2 together yet, that handsome gentleman pulling a Captain Morgan in the picture is Yours Truly showing off the proper way to deploy lemon grass against the local pestilence. This is my new go-to strategy. Perhaps it will be equally effective with other herbs in other climates where lemongrass doesn't grow. I encourage any and all anecdotes on natural mosquito repellent. Since im not familiar with your soils, forgive me if this is a stupid question, but rather than digging a pit into the subsoil could you just expand the area Dug and skim only top soil? What happened the the top soil from underneath the bed? One of the advantages that I am expecting from sinking it rather than scraping topsoil from around the bed is that a sunken bed should hold more water. Kinda like putting a swale underneath the bed itself. The other reason is that the subsequent beds are going to be formed closely together so more closely resemble the wide rows that everyone here is accustomed to so that the hugelbeets are more accepted. The space between these first two beds is just wide enough for a wheelbarrow to get through so there really isnt a very wide are to scarpe topsoil from anyways.